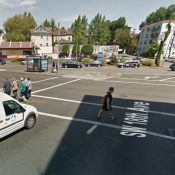 It’s not exactly a full “protected intersection” as first envisioned by a Portland planner over four years ago; but the Bureau of Transportation is set to add concrete buffers between the bike lane and other vehicle lanes at several corners to a notorious intersection of West Burnside this fall. 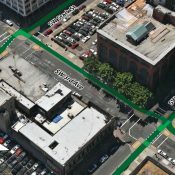 As part of a series of projects to improve safety on the high crash corridor, PBOT will add median islands and green coloring to separate the bike lanes where Burnside meets 18th, 19th and Alder (just north of Providence Park). Burnside is a major thoroughfare between the West Hills and I-405 with 21,500 to 25,000 vehicles using it on an average day. That high volume of traffic, along with its four-lane cross-section and speeding drivers makes it very intimidating and dangerous. PBOT data shows that Burnside has three times the citywide average rate of collisions involving people on foot — and 76 percent of those crashes are west of the Burnside Bridge. Despite being an important cycling connection between Goose Hollow/Providence Park and northwest Portland, the crossing is listed as a caution area on PBOT’s bike map. 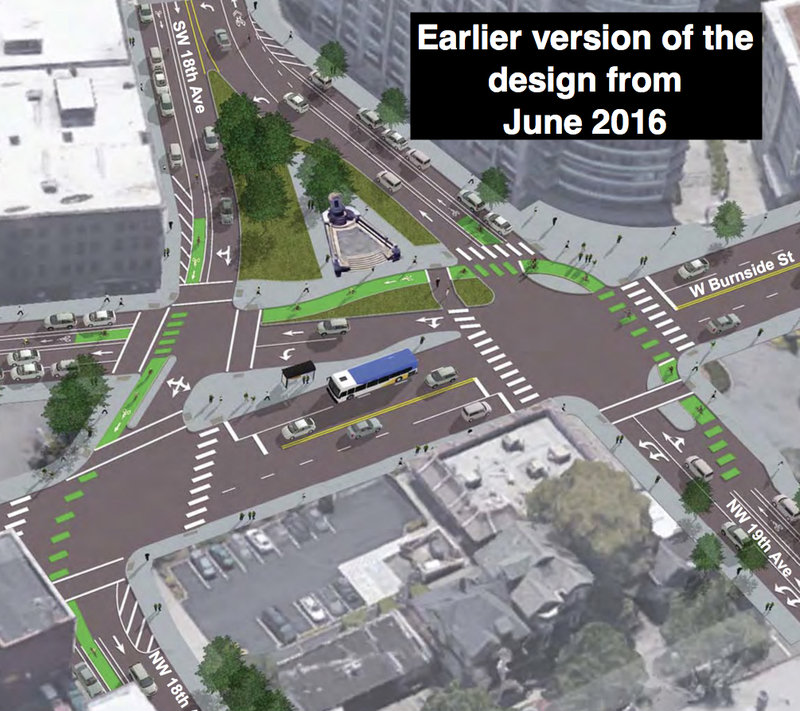 To help make it safer, PBOT plans to add green coloring and a series of median islands to protect the bike lane. New crosswalks are also in the plans. To help improve access to transit, PBOT will increase the size of the existing transit island that stands in the middle of the four streets. Traffic signals and curb ramps will also be upgraded as part of the project. An earlier version of the design shown in the June 2016 West Burnside Multimodal Study created by Kittelson & Associates for PBOT. As you can from the image above, the final design has changed from a 2016 report that showed even more green space and concrete curbs to protect bicycle riders. Unfortunately several elements of this more robust design have been left on the cutting room floor. PBOT says they expect to begin construction in September. Learn more about this and other updates coming to Burnside on PBOT’s website. Northbound bike lane to 18th isn’t too bad but SUV drivers will right hook a lot of cyclists. Southbound cyclist will be trapped behind the barrier (unless it is 4 foot tall) by bigwheel 4WD driving across the barrier making the right turn. Myself southbound I will hit the light and go straight across Burnside in the straight traffic lane without sliding on the downhill braking, then cut into the bike lane on the left side if delivery trucks or taxi’s are not blocking it. It looks great… exceeeeeeept… why did they put car parking to the right of the bike lane southof Burnside on 19th? Makes no sense. It will even be a difficult space to squeeze in, as you will have to nose into the pedestrian crossing and back into the bike lane to get there. Angle is too steep. Placing the parking adjacent to the car lane would solve the issue and make the bike lane safer. Indeed. The car parking south of Burnside along 19th would be better placed adjacent to the normal travel lane to protect what should be a one-way protected cycle track there. The lack of perpendicular streets within the block presents little reason to exit the bike lane here (for a hypothetical left turn). 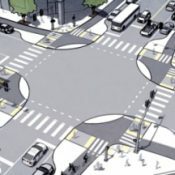 There is already a proposed curb island to direct bike traffic at the start of the block. If parking lane adherence is an issue movable planters a la NE Multnomah Blvd would work to enforce the lane configuration and minimize conflict. Thanks for the warning, I’ll know to avoid this area in the future. All that hardscape is a hazard for cyclists, I’ll take alternate routes, TYVM. FWIW, the only thing preventing cyclists from taking the lane after this thing is built is the mandatory sidepath law, ORS 814.420. Repeal the sidepath law and the city can continue to build all of this experimental bike lane crap it wants, otherwise, I’m opposed. what happened the last time someone was cited with violation with the mandatory sidepath law in portland? PS: i enthusiastically support infrastructure that annoys buzz even though i violate the mandatory sidepath law every day. The city has blinders on when it designs for the lowest common denominator – fearful, novice cyclists – and fails to consider or incorporate design considerations for the considerable number of experienced cyclists already out there. Even novice cyclists will advance their skills with practice and experience, and probably outgrow these designs. And the hardscape, particularly the raised concrete medians, are in fact a definite hazard to cyclist; I know more than a few cyclists that have been injured hitting them, mostly in low light conditions, because they don’t illuminate them very well and once they are a few years old they will have developed a patina of light-absorbing black dirt and mold covering them. It’s elitist to point out that the city is actually building traffic hazards when they install these raised medians? Yes, please repeal the mandatory sidepath law. Soren, I’m not worried about a traffic citation, I just don’t want it to count against me in the event of a collision. i’ve heard this questionable narrative dozens of times but, somehow, no one has ever been able to provide a single example. Wow, all the brave cyclists are out in force. Maybe those brace cyclists will also be happy to demonstrate taking their kids or grandparents through on their brave route. Personally, that whole thing should be ripped out and a real roundabout should be put in. Not like the fake roundabout at 39th and glisan. No stop signs. It almost looks like you could, but I think the intersection might be a bit narrow for a two-lane roundabout. They would have to rip out the little memorial plaza in order to fit one in, which won’t happen. All I see are two parking lots and McDonald’s standing in the way. Win-Win-Win. Want 8 to 80 unskilled cyclists to be comfortable in the US? It will take $12/gallon rationed gas, separation of driving from the US Constitution and probably need a US military defeat in the Mideast to kick the whole thing off. Nothing bad like that could ever happen. We have moderate and deliberate foreign policy experts like John Bolton and Nikki Haley on the job to make sure there are not going to be any conflicts in the middle east that would disrupt the flow of oil . This “competent and confident “grandpa would much prefer riding my very young granddaughters through the existing configuration over the abomination of conflicts and hazards in the proposed obstacle course. I really wonder how many of the people who harp on 8-80 ever ride with the very old and very young. What I love is…no room for bikes on Burnside. Cars get arterial routs…but not bikes. Go Portland! Bike lanes on 18th and 19th will be a real improvement. The design right at the Burnside intersection looks unspecial. This is a complicated intersection, drivers are trying to keep track of cars, bikes, pedestrians from so many directions, that right hooks will remain a significant risk. As for no bike lanes on Burnside, there never will be – unless and until the couplet happens (no sign it will be revived, so don’t hold your breath). A one way Burnside would be wide enough for traffic lanes, bike lanes, and wider sidewalks with more trees shading pedestrians. A traffic lane can move 800-1300 vehicles per hour, depending on the adjacent friction. The most common friction is adjacent car parking and left turns in a left through lane. 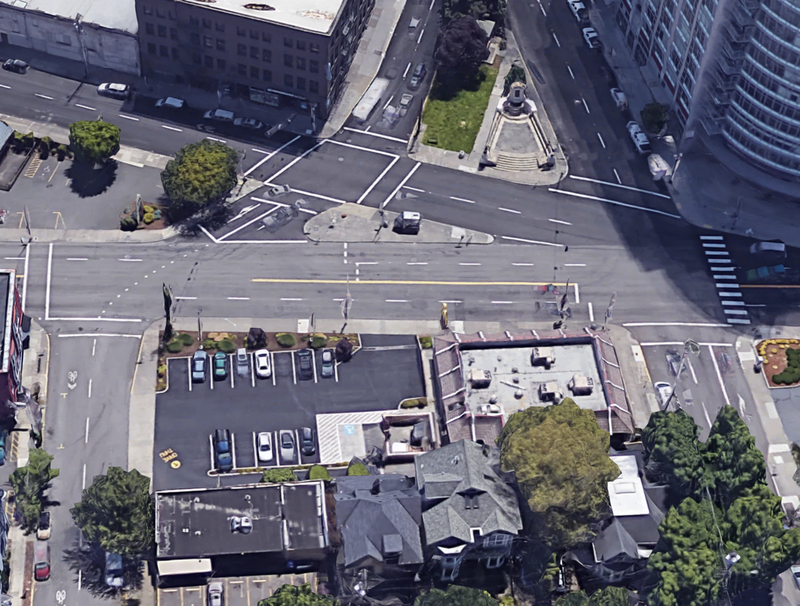 A 3-lane section on Burnside might be as efficient as the current 4-lane section, and would be slower with space for left turning drivers out of the way of the through lane, both safer for operation. Thanks. That is an interesting idea! I keep looking at the road and thinking that the main street through Portland should be a lot nicer, with wide tree-shaded sidewalks, cafes and seating, nicer for bikes and peds. Its not going to be Ramblas but should be much better than it is. The challenge I see with using the typical style of road diet (one lane each direction with center turn lane) is 1) busses needing pullouts to avoid blocking the one travel lane, and 2) since left turns off Burnside are mostly prohibited anyway, the center turn lane seems out of place. I’d really rather see W. Burnside be one-way east-bound, with two lanes (one reserved for right turns and buses during peak hours) with a bi-directional bike lane and wider sidewalks, paired with NW Couch as one-way west-bound, with two lanes (one reserved for buses during peak hours). I think this would allow wide sidewalks with street life. Maybe turn pockets at key intersections where left turns are allowed. You think this would work? Good thought–few things make me feel more comfortable when I’m driving on busy surface streets than a dedicated left turn lane that reduces the “will I get rear ended here?” feeling. I ride through this intersection on 18th or 19th twice a day on the way back and forth from the Max stop at Goose Hollow. I find the single biggest hazard is the crazed motorists breaking any and all traffic laws to get in to the drive-thru lane at the Mcdonalds on the North Side of Burnside along 19th. They swap lanes mid intersection, u-turn, right- hook etc. For this to work and be safe the entrance to the Mcdonalds along 19th will have to be shut down or the transition zone to the Bike Box on Southbound 19th will become a scene of untold carnage. Isn’t that an exit from the drive through? I’ve seen plenty of drivers cut across lanes to get into the parking lot from NW 18th, but never from SB 19th. I lived really near this intersection for years. It is a scary intersection to traverse by bike, especially if you’re trying to head into downtown by turning left from 19th to Alder. 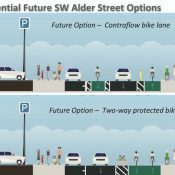 By extending the existing bike lanes from Everett / Glisan to Alder, and adding protection, this will be a massive upgrade over the existing conditions. It will also be a huge improvement for people on foot who are trying to cross the street or even just walk along the south side of Burnside. I hope that at some point in the future the 18th/19th couplet can be upgraded to a protected facility. It would also be great if the bike on Alder was protected and extended further into downtown. However, nothing in this project precludes those projects from happening in the future. A 3-lane section on Burnside might be as efficient as the current 4-lane section, and would be slower with space for left turning drivers out of the way of the through lane, both safer for operation. The BTA said this in about 1991 about Hawthorne Blvd., too. The local businesses fought it, the city ignored it, and nothing changed. Eastbound downhill on Burnside it’s easy to take the lane and keep up with, and even pass, the motorists stuck in traffic. Looks pretty good! The crosswalks on both sides of 18th and 19th, crossing Burnside, is a much appreciated improvement. As someone who is in this area for Timbers/Thorns matches, those missing crosswalks are a big inconvenience. 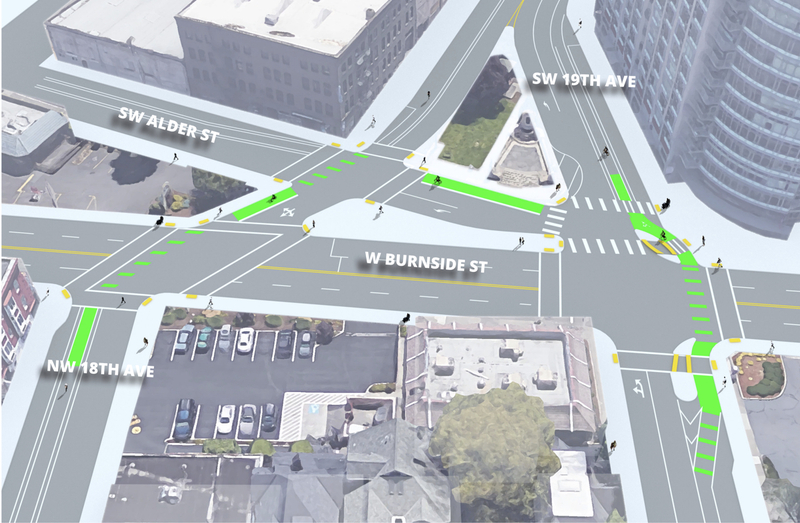 The new Burnside-> Alder maneuver for cars will help calm (impede) speedy motorists, making the crossing of Alder by bike or foot much easier, too. I frequently turn left across Burnside onto Alder. I guess that will now require a 2 stage turn? Why is everything safer also slower? Nothing says you can’t still take the left lane on 19th to make that turn. Oh, except ORS 814.420, I guess. Simple. Treat the potential for a right hook as a hazard (since that No Right On Red will probably only get 50% compliance) and you’re allowed to move out of the bike lane/ side path and ride with traffic as you normally do. That’s the trick: you and I know that right hooks and their potential are a real hazard, but I don’t think Law Enforcement necessarily sees it that way; I haven’t found the modifiers “likely” or “potential” in the law yet. I wish they would change the “must turn right” in the exception for traveling to the right of motor vehicles at an intersection to “may turn right”. That wording/omission seems to disregard potential right hooks as an exception for which a bicyclist may leave a bike lane. Yes, it seems to be exceedingly rare, but Oregon law gives traffic officers an easy way to target and cite bicyclists for safe operation and call it either “improper use of lanes” (as a violation of 814.430, I think) or “failure to use bicycle lane or path”, a violation of 814.420. I hope there are bicycle signals that give cyclists a 5-10 second head start. I rode that intersection for the past 15 years in my commute to beaverton. It honestly never came across as at all sketchy. I’ve made it unsafe by sprinting north down the hill for a yellow light and trying to pass on the right coming north on 18th, in which case it super sketchy, but that’s on me. Coming south it is chill, just take the lane down the hill to the light and watch out for traffic coming out of McDonalds. Shows how oblivious I am to intersections people find to be dangerous. Seriously, this was always my least stressful intersection on my commute.